We are WNY's only authorized Dinan Dealer and Installer. Upgrade your BMW with Dinan and The Little Speed Shop today. The Little Speed Shop is WNY's only Dinan authorized dealer and installer. Founded in 1979, Dinan® is well established as North America’s premiere BMW tuner. Dinan develops, manufactures and markets a comprehensive line of high performance products and systems, distributed through a nationwide network of Authorized Dinan Performance Centers that includes select BMW Dealerships and Independent BMW Service/High Performance facilities. Dinan’s industry leading warranty program, quality products and solid engineering have helped to make Dinan an almost household word among BMW driving enthusiasts. Road tests conducted by major automotive enthusiast publications over the last 30 years place Dinan enhanced BMWs on a performance level with some of the most exotic sports cars in the world. At the same time, Dinan enhanced BMWs are widely renowned for being civilized and reliable, providing a high performance BMW-like driving experience without equal.Dinan’s comprehensive warranty program, introduced in 1996 with the cooperation of BMW of North America, provides BMW owners with matching coverage to that offered by BMW’s new car warranty, ensuring that Dinan performance enhancements and the BMW they have been installed in are covered for up to 4 years or 50,000 miles. BMW automobiles can now be performance-tuned without the associated concern of negatively affecting the new car warranty coverage, making the idea of enhanced driving fun and excitement appealing to a rapidly growing number of BMW drivers. Dinan offers a broad range of BMW performance products from engine, driveline and chassis tuning components to complete Dinan Signature Vehicles and special Factory Works programs. 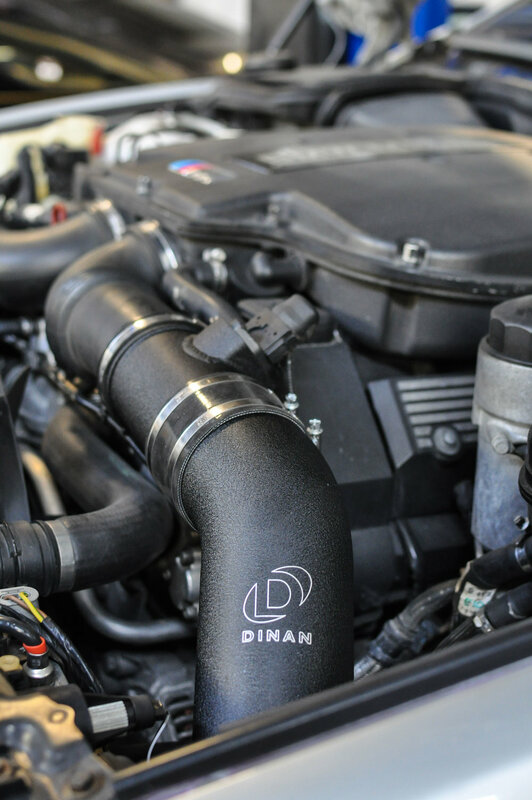 As a serious BMW Tuner, Dinan’s objective is to offer complete performance solutions for the entire range of BMW models. We believe that every BMW driver deserves the opportunity to get the most from their car. From faster acceleration to improved cornering capabilities and stopping power, Dinan takes the guess-work out of creating the high performance BMW of the enthusiasts dreams with compete, balanced performance systems. A choice of several complete Signature Series programs are available for each BMW model in order to meet a broad range of performance requirements and budgets. In addition to stunning performance, you will also enjoy the exclusivity of owning a serial numbered Dinan Signature BMW, registered with both BMW and Dinan. A detailed description of the various Signature Series programs for each BMW model is available in the “Performance Products” section. Whether you are interested in a complete Dinan® Signature Series for your BMW or the individual components that comprise them, we offer the means to make your BMW driving experience even more exciting, without sacrificing warranty coverage or the civility you expect from a BMW automobile. As an Authorized Dinan Performance Center, The Little Speed Shop is fully prepared to help you begin driving the high performance BMW of your dreams today.